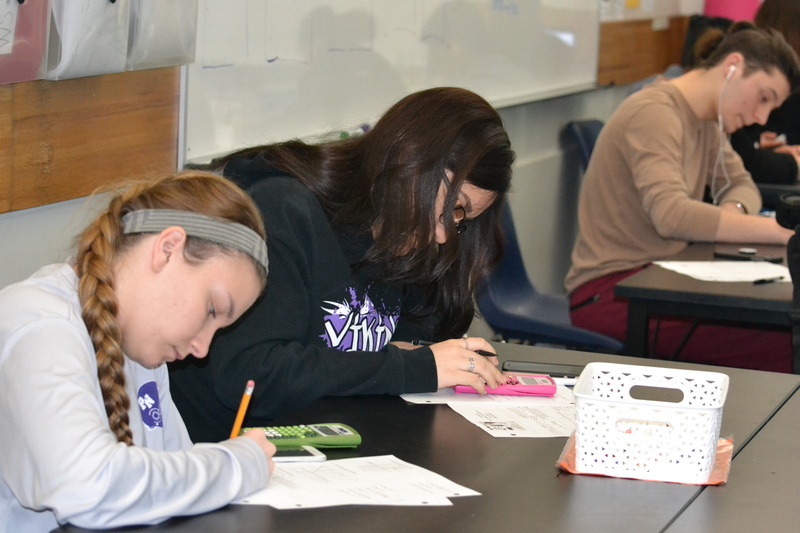 Junior Katie Carpunky and senior Elizabeth Santiago complete homework during Overby’s Pre- Calculus class. “I think that what I find with the typical student that has checked out either they are frequently absent or when they are here physically they are absent mentally and I try to prompt those students,” said Overby. 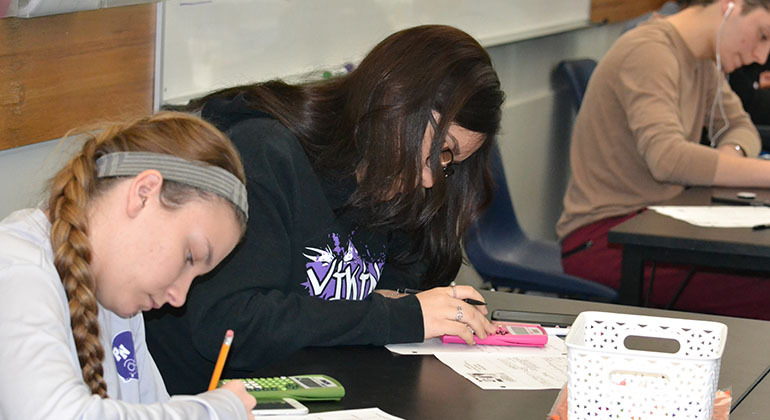 With the end of the year quickly approaching, the hard work, determination, and studiousness that many students showed at the beginning of the year have begun to dissipate. However, students aren’t the only ones who are tired and anticipating the summer. Teachers are feeling the end of the year fatigue, too. Although the second-semester slump affects the general population, there are students who are able to stay motivated and put in the work, and teachers look forward to seeing the growth of these students. “It’s a really interesting time because I’ve had the students for long enough where they can really start developing and gaining their skills. Sometimes you do see students blossoming more,” said Forst. However, there are some students, specifically graduating seniors, that seem to lack the motivation to participate and engage in class. Teachers try to encourage these students to stay motivated while motivating themselves, but it is not always easy. “When it refers to seniors, you start seeing a drop in performance and general engagement. That goes for students that would typically be performing high in a class. In general, there is a sense that everyone is tired,” said Forst. Seeing a student checking out of the learning process can be difficult for teachers to reconcile. Despite this, it is important for them to remain optimistic and not take it personally. “I have to fight not taking it personally. I think because I put so much effort into planning my lessons and teaching my lessons, it’s difficult [not to]. If a student’s checked out and not taking advantage of what I’m doing and teaching in class, it feels like I’m wasting my time. It is discouraging, but I don’t feel defeated,” said math teacher Nancy Overby. Because this time of year can be so taxing, some teachers look within themselves to stay motivated. “All of us have a certain level of work ethic inside of us that keeps us going no matter what the circumstances are and I think I rely on that a lot. I have high expectations of myself that I’m always going to do my best and bring my best, and my best is going to look different every day. That’s what motivates me, being the best person and teacher I can be. And some days it’s hard,” said Overby. Other teachers look to outside avenues to help keep them moving forward. “It’s really tempting to [lose motivation] especially when you’re facing disillusionment where it’s like ‘no matter what I do, nothing will change,’ so it’s tough. I think it’s important to keep an eye on your success and your mental health. Otherwise, it’s really easy to go through the motions, sit at the desk like a zombie, become bitter or hold resentment toward students,” said Forst. Forst, who leads Yoga for Teachers after school, finds that engaging the body and mind is necessary to relieving stress. “If you can approach the challenge of making time for your own health, whether it be time and space to meditate or doing the things that are solely for you, [it will help keep you motivated]. I’ve found that mediating after school is really helpful. If I can do that even just for a few minutes, then that helps,” said Forst. Regardless of being a student or a teacher, one commonality is that both are stressed and tired as the year comes to a close. “I think the most important thing for students to remember is that teachers are people too. We have our own good and bad days. We have to deal with our own personal loses and deal with trauma. All the things we’re expected to help students navigate, we have that as well. So be considerate of teachers, in the way that we are with students when we know that they are having a difficult time,” said Forst.